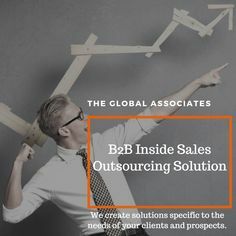 The Global Associates Telesales Companies must understand the significance of mastering the art of conversation in today’s super-competitive business environment; virtually every business relationship starts with a meaningful dialogue between two interested parties, after all. It’s impossible for telesales companies to undermine the significance of having energetic, fruitful conversations with the customers; selling is all about interacting with people. You must make the customer feel comfortable if you want to take the sales process forward; understanding some basic principles of the trade is certainly necessary in this regard. Connecting well with their customers is essential for telesales companies to change their perspective and provide an insight about their usefulness for their purpose. This would help both parties as an mutual understanding develops to take their relationship forward. You can thus build rapport with the prospect and convince them about spending some quality time with you discussing their issues and requirements. Following are some essentials to help you get along well with the prospects. Change your approach, behave like a problem solver and not as an outright salesperson. You should do your homework to be well aware of the issues and requirements of the customer before you make a call. Demonstrate that you have the capability to solve their issues to take the sales process forward. You should have an exhaustive set of questions to elicit the right information from them to form a clear idea about their issues and requirements;,offer only what the customer really needs. The habit of working with a well-crafted script is a good practice, however, sticking blindly to it is not. You should have a flexible approach and go with the flow;customer’s requirements should be your first priority. Make it about them, not about your company. It’s essential for telesales companies to build credibility by showing their capability and good intent. The customer wouldn’t come forward to deal with you unless they are convinced you have their best interest at heart.Even before they are willing to buy from you, offer knowledgeable suggestions and latest industry trends to win them over.